Several portraits of the leading business men and women of Alta Vista, Kansas. They include J. E. Reagen, August Wolgast, W. C. Meseke, Otto Wolgast, Percival Hawes, T. A. Gantz, G. W. Gantz, L. A. Johnson, P. Holman, William Kahle, Chris Johnson, P. E. Hesser, S. P. Scott, Chris Langvardt, J. L. Snodgrass, Mrs. A. M. Hunger, J. N. Bolton, Myrtle Coulman, H. E. Syring, B. R. Hull, Frank Bailey, Frank Amsbury, W. A. Little, B. 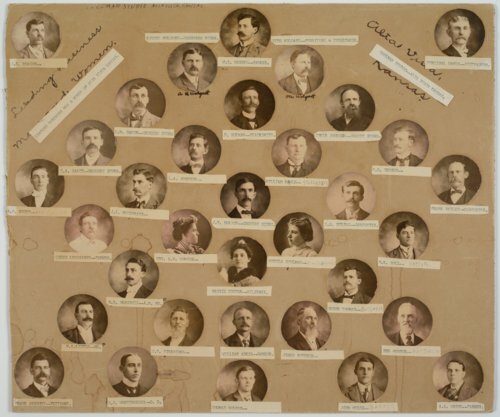 B. Brechill, H. J. Wertzberger, J. T. Firestone, Maggie Cooper, Thomas Holman, William Addie, James Butcher, Union Thomas, John Wilde, Ben Hesser, and A. A. Orton.